Finding a 12-volt TV to put in your RV bedroom or living area that runs off 12 volts is not as easy as finding one for regular homes. 12-volt TVs are not as popular. Therefore the market isn’t as big in the category. That said, there are some excellent choices, and that’s what we’re going to look at today. The big difference between a 12-volt and a 120-volt TV is just that, the voltage. If you’re camping without hookups and no power, a 12-volt TV can run on the 12-volt battery in your RV. But if you plug a 120-volt TV into an outlet in your trailer, it won’t turn on unless you’re running a generator or use an inverter. An inverter turns 12v DC into 120v AC. You might have seen a trailer with a TV on the wall at the dealership, that was most likely a 12-volt tv. Unless it’s bigger TVs (we’re talking 42” and up) RV manufacturers usually install 12-volt TVs. A lot of manufacturers use Jensen TVs and while there are some for sale online, I believe the TVs we’re comparing today are all better than Jensen’s models. Today we’re taking a look at six different TVs in different sizes that will work great in RVs. As a consumer, there are a few things to consider, and you might have questions, scroll to the bottom of the post where I’ll talk about a few points to consider and questions related to RV TVs. This is an awesome TV with lots of features. Axess has put a 1080p led screen in it so the picture will be excellent on the 22-inch screen. Since a built-in DVD player takes up some space on the back, you should be aware of the thickness of the TV if you’re planning on hanging it on a wall or put it in a TV cut-out in your RV. Regarding inputs and outputs, you get a cable or antenna RF port, VGA, 3.5mm port, USB, one HDMI port, headphone output, a coaxial output port, and CVBS input. Included are an AC power adapter and a 12v car cord. Note that while Axess offer different sizes of TVs, not all of them have 12v capabilities. The 22-inch TV we’re looking at does but not the 32-inch model, for example. The AXESS TVD1805-22 is a TV that would work great in a bedroom where you want to watch the occasional DVD movie. I like the thin bezel design. It looks more modern and takes up less space than a TV with thick bezels. Next up, Supersonic SC-2412. A TV that is a lot like the previous one by Axess. It’s slightly bigger with its 23.6-inch screen size. It runs the same resolution at 1080p which means that the picture will be clear, especially with the built-in noise reduction feature. A DVD player is built-in and lets you watch DVD movies without connecting an external player. That’s important to remember when considering what TV to buy. Do you mostly watch movies on DVD? Then your DVD player will take up more space next to the TV if it isn’t built-in. This can be hard to do if you want to hang it on the wall unless you put a shelf under the TV. A TV with a built-in DVD player will usually use less space in total than a TV with an external player next to it. The inputs and outputs on the Supersonic SC-2412 include 1 HDMI, 2 USB, VGA, RF, 3.5mm audio jack, headphone jack, CBVS, and Coaxial output. But there’s more. There’s also a built-in SD/MMC/MS slot so you can input your phone or camera SD-card directly into the TV and view pictures and media. If you take a lot of pictures and like to show them to friends and family, this is a nice built-in feature. On the back, you’ll also find standard VESA mounts so you can hang it on the wall, but if that’s not for you, you can use the included stand. As the name implies, this is a 28-inch TV from a company called Free Signal TV. It’s a 12-volt TV with a resolution of 1366 x 768. The Transit 28” does not have a built-in DVD player. Where Free Signal has done a great job is at the inputs and outputs. We get not only one, but 3 HDMI ports. In today’s electronics world, most consoles and boxes use HDMI to transfer signal to the TV, so the fact that we get 3 HDMI ports is a big plus in my book. If the TV only has 1 HDMI and you want to plug both a DVD player and a gaming console in, you’ll have to switch between them or use composite with one of them resulting in worse image quality. In addition to HDMI, you’ll get VGA, RF, 3.5mm audio jack, and USB input. On the back, you’ll find standard VESA mounts for mounting the TV on the wall. It’s a 12-volt TV, but it can be used at home with 120v if you buy the optional AC adapter. With 300 cd/m2, the Transit 28” has high brightness compared to other products in today’s comparison. Where the Free Signal TV Transit 28″ falls short in my eyes is with its low resolution. The difference between 720p and 1080p isn’t very noticeable for most people if you sit about 7-10 feet from the TV, but in 2018 I expect better resolution on a 28-inch TV. But again, this is due to the market being small, and companies get away with this when there aren’t a lot of products to choose from. Next up is another 28-inch TV, this time from Continu-us. It’s very much like the previous Free Signal model. It offers the same screen size, the same brightness, and the same great selection of inputs and outputs. The only difference I see compared to the Free Signal model is with its even thinner bezels. On the back, you’ll find standard VESA mounts for mounting the TV on the wall. You’ll also find a great selection of inputs and outputs. 3 HDMI ports, USB, VGA, Component, 3.5mm audio jack, RF, headphone output, optical output and audio line out. These connections will let you keep all your boxes, players and consoles plugged in at all times. As with the Free Signal model above, I have to say the same thing about the low resolution. I wish they would’ve put a 1080p panel in this to increase the picture quality. The thought behind it might be to use less power, and while I applaud that effort, I wish I had the choice to go with a 1080p model. This is a TV I could put in a living area. 28-inches isn’t massive, but it’s big enough if you don’t sit more than 5-7 feet away, based on my experience. An AC adapter to use with 120v outlets is sold separately. 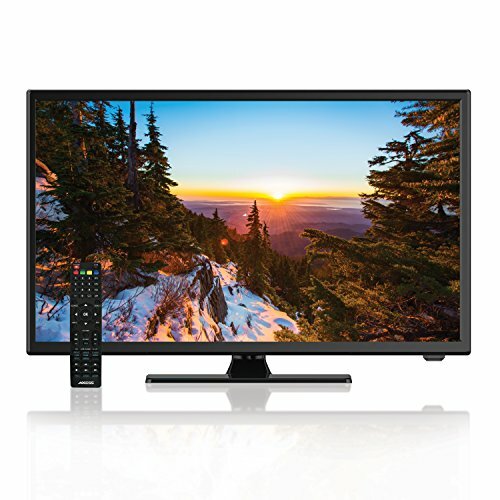 Here’s a 32-inch LED TV from Free Signal TV that I believe is a great choice for most bedrooms or living areas. With a resolution of 1366 x 768, we’re still missing a 1080p option on 32-inch models, but it still has great picture quality. A 12v connection lets you plug it and run it off batteries. Free Signal sells an optional AC adapter for when you want to plug it into regular 120v outlets. Free Signal TV has put 3 HDMI ports in this TV which I always appreciate. Other than that you’ll get a 3.5mm audio jack, optical, RF, composite, headphone output, USB and VGA. Let the TV stand on its own with the included stand, or hang it on the wall with the standard VESA mounting points on the back. I believe the Free Signal TV CT-32T18 is one of the best TVs in today’s comparison unless you want a DVD player built-in. Great size, included stand and power cord, good HD picture quality, and thin bezels. All it’s missing is a 1080p resolution. Last but not least is this 40-inch model from Free Signal TV. If you have the space for it, this is the TV to get. At 40 inches, you’ll get a good sized TV for an RV. The best thing about it, except its size, is the 1080p resolution. With 1920 x 1080, your movies and shows will look much better, and 40 inches will look big in an RV. With 250 cd/m2, you’ll even get great brightness from this TV. A 12-volt cigarette power cord is in the package, so it can be plugged in directly. An optional AC adapter (not included) will let you plug it into 120-volt outlets. Just as with Free Signal’s 32-inch model, a stand is included, but you’ll always have the choice to hang it on the wall with the standard VESA mounting points on the back. The Free Signal TV 40” doesn’t have a built-in DVD player, but with its 3 HDMI ports, you’ll be able to plug in all your external boxes and players that you need. A good reason to not buy a TV with a built-in DVD player is that DVD players fail more often than TVs. If you buy a TV with a built-in DVD player and the DVD player fails, you’ll have a big TV with a useless player. An external player that fails is easier to replace. In addition to 3 HDMI ports, you’ll get USB, VGA, composite, 3.5mm audio jack, optical, RF, and headphone output. Something to note and consider when looking at this TV is that it weighs almost 16 lbs. If you’re going to hang it on the wall, you’d want to make sure your wall and mount can handle the weight. For A 22″ With DVD: AXESS TVD1805-22 – At 22 inches, the AXESS TVD1805-22 is a good choice for a bedroom TV. With all the essential inputs and outputs, and a built-in DVD player, you can hang this on the wall and have an entertainment system in your bedroom. All your content will look great on the 1080p resolution screen. 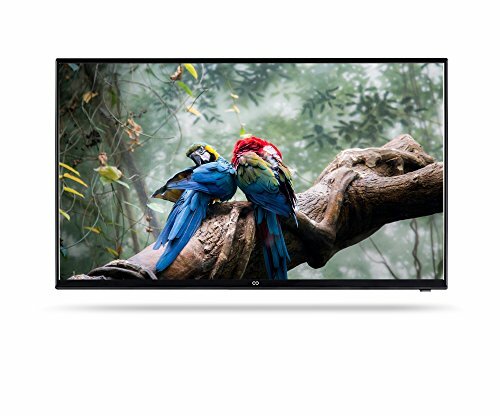 For A 28″ Without DVD: Continu.US CT-28T18 – The CT-28T18 is an impressive 28-inch TV with its high brightness and a great selection of inputs and outputs. Thin bezels, lightweight, several HDMI ports and a 720p 60Hz screen will work great in an RV. 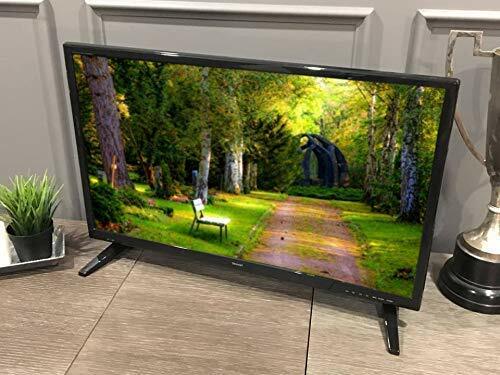 For A 32″ Without DVD: Free Signal TV CT-32T18 – I’m impressed by what Free Signal TV has to offer, and that’s why this is one of my favorite TVs today. Great selection of inputs and outputs, HD resolution, and thin bezels, is exactly what you want from a 32-inch TV in your RV. 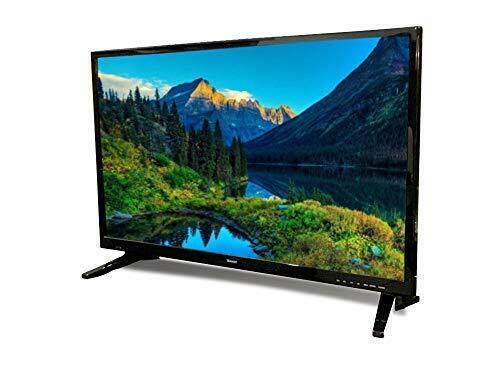 For A 40″ Without DVD: Free Signal TV 40” – If you have the space for it, this is an incredible 12-volt TV for RVs. Free Signal has done what they did with the 32-inch model but made it bigger. With the same great selection of inputs and outputs, 3 HDMI ports, 1080p resolution, and in a thin package, you won’t feel trapped in your RV on a rainy day if this is part of your entertainment system. 12 volt vs. 120 volt – If you always camp with full hookups or at least electricity, there’s no reason for you to go shopping for a 12-volt TV. On the contrary, if you never camp with full hookups, there’s no reason to have a 120-volt TV unless you plan on running the generator every time you want to watch TV. Of course, other options let you use the outlets while dry-camping. Solar panels, inverters, Goal Zero and products like it, are popular ways to go. Screen Size – The first thing you should consider when looking at TVs is the size of it. By that, I mean the screen size, the area of the TV that displays the picture. Do you have enough space to fit a 40-inch TV in your RV? Maybe a 22-inch TV is all you can fit in your bedroom. Check the measurements and go measure spaces in your RV, so you know it’ll fit. Resolution – If you’ve read about each TV we’ve looked at today you might’ve noticed that I complained about TVs not having 1080p resolution. The resolution is how many pixels the TV can display. A lower resolution means fewer pixels, which means a less clear image. If you’re sitting at a couch 10 feet away, it won’t matter to you if the TV is 720p or 1080p as it will be hard to see a difference. But if you’re in bed only 5 feet away from the TV, it’ll be more noticeable. Now, is this something that matters? Probably not. Maybe you’ll just be watching free over-the-air channels in less than HD 720p quality anyway. But it’s something I want you to consider because it depends on what media you’re going to be consuming, and how far away you’ll be from the TV when it’s installed on the wall. Built-In DVD Player – I don’t recommend buying a TV with a built-in DVD player, and I’ll tell you why in the FAQ below, but if you do want a TV with one built-in, it’s something to take note off. Not all TVs we’ve looked at today have built-in players. That said, if you plan on watching DVD movies on your TV in the bedroom, a built-in player will be better than having to deal with installing an external player on the wall next to the TV. Weight – The difference in weight of the TVs in today’s comparison isn’t huge, but it’s there, and if weight is an important factor, make sure you check how heavy the TV is. If you plan on hanging it on the wall, and you’ve installed a wall mount to a stud in the wall, it’ll most likely be able to handle the TV without issues. Inputs/Outputs – The inputs and outputs of a TV are the connections where you plug in your external players, computers, and consoles. Do you need 3 HDMI ports or is one just fine since you’ll only plug in a cable box? If you plan on buying a soundbar, you should check what outputs it has to be sure that your TV will work with it. Note that HDMI is the most popular choice of connections between TVs and external players and computers nowadays. Power Usage – The bigger and the better TV (regarding resolution), the more power it will draw. Higher brightness will also use more power. Check how many amps your RV battery has, and calculate how many amps a specific TV will use in x amount of hours. 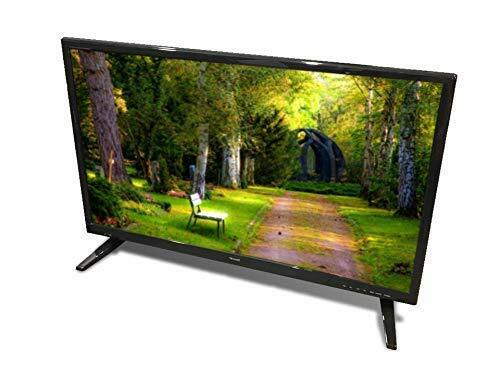 You can often find the power consumption in the specifications of a TV or by contacting the manufacturer. Brightness – If you plan on watching TV during the day in your RV, how bright the TV is matters. If you only watch TV at night, you should focus more on other specifications. It matters during the day because sunlight will make the TV appear darker and harder to see. If you’re looking for a TV to hang outside to watch during the day, it’s even more important because then you can’t do a lot to cover the TV from sunlight. Speakers – Okay, this isn’t something to consider, but something I thought I should add. The built-in speakers in most TVs are terrible. They will be good enough to watch some tv, but don’t expect any high-quality sound from your TV speakers, even less so from a 12-volt TV built for RVs. The best thing you can do after buying a 12-volt TV is upgrading the sound. I recommend buying a Bluetooth speaker that you can connect with a 3.5mm cable to your tv, something like the Bose Soundlink Mini. I’ve used one of these in front of my TV, and the sound is incredible for its size. Are 12-volt TVs built differently than a 120-volt? Most 12 volt TVs are built for travelers that must be able to run it off a battery. What that means is that they often have more robust chassis that are reinforced to withstand vibrations going down the road. How do I hardwire a 12-volt TV to my RV battery? If there’s no 12v outlet where you want to put your TV, you can make your own with a cigarette lighter outlet. This outlet can be run directly to your battery, or the fuse box. If you run it directly to the battery, I recommend using an inline fuse on the positive wire. Another option is to splice into any 12v lights in your RV as long as the wire is big enough for the amps required to run the TV. How to hang a TV on the wall in the RV? The most important thing after deciding where to put your TV on the wall is finding a stud in the wall to secure the mount to. Then depending on the weight and size of the TV, decide what anchors or screws to use. You should also be using a wall mount made for RVs that can lock the swivel during travel. Mounting Dream makes a mount that will work with all the TVs in today’s comparison and I recommend. Why should I avoid a TV with a built-in DVD player? DVD players fail more often than TVs from the vibrations going down the road. If you buy a TV with a built-in DVD player that might fail after a year or two, you’ll be left with a thick TV and no DVD player. If you buy a TV, and then buy an external DVD player, you can replace one of them when it fails and save money. The biggest reason I believe this is because I made the mistake of buying a TV with a built-in DVD player and it failed within a year. The TV is still going strong though.